I've been with my head in the numbers over the past few days. Scribbles and scribbles of calculations all over my desk and couch, little pieces of test knits and lots of re-calculations have been keeping me quite occupied and busy. They say the devil is in the detail and if this is true, well, I have been chasing the devil around like crazy. And let me tell you, it hasn't been easy to catch that devil and he has repeatedly laughed at me while I am trying to reverse engineer my Dries van Noten sweater! 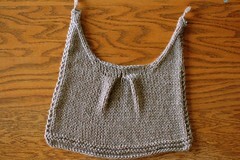 At first glance, the sweater looks pretty straight forward. However, there are many subtle details within this piece: soft curves at the side seams, a back neckline that is quite deep and has a sweet little plead, a front neckline that has a subtle curve and sleeves that have a very slight bend. If the devil is in the detail, then sweet pleads, soft curves and slight bends are accompanying him. Oi vey. While I chase my devil around, my mind wanders to a much much easier sweater design I produced in Summer of 2008: Mata Hari. 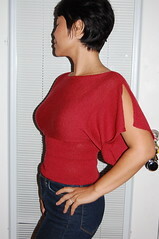 How I loved making my Mata Hari sweater! 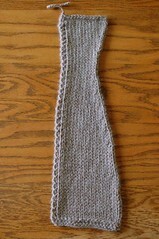 This sweet little piece of knitting couldn't have been more easier and straight forward. 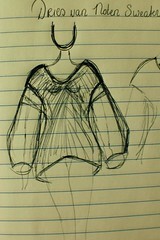 Calculations were dead simple, because really all there is to this sweater are straight lines. No subtle curves, no pleads, no slight bends. I am simply blown away by this style of design. Minimalist to its fullest beauty. Instead of boring you with texts and texts of calculations, I am going to show you what I have figured out so far. 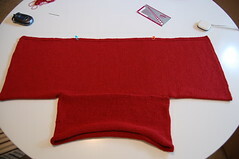 Because this sweater entails a lot, I chopped it up in bite size pieces. When I am satisfied with all the pieces, I am going to bring it all together in one harmonious piece. Fingers crossed they will all play nice together. The subtle curves of waist and hip line. 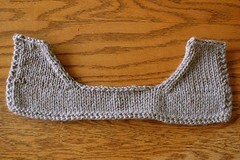 See on the right side of this piece how if gently curves? 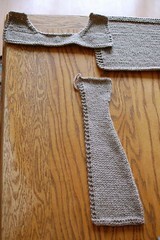 It is still in its infant stage but can you see the piece slowly coming together? Dang it. 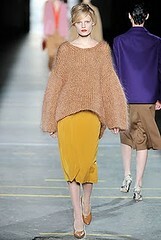 Why oh why aren't there patterns like this Dries van Noten sweater offered in the hand knitting industry? I would buy a pattern like that in a heartbeat and I wouldn't have to go chase some devil to reverse engineer a sweater!!! Submitted by Anonymous on Thu, 08/12/2010 - 23:49. I would buy a pattern like that as well! perhaps you should change it just enough... add your own touches to it and publish it yourself! Submitted by Nancy Ricci on Fri, 08/13/2010 - 04:26.